This post is going to focus mainly on the entry hall. The house has what is known as a “Georgian” floorplan, however modified. It was important for us to say something about our taste, and interests upon someone walking through the front door. The high ceilings and elegant staircase provided us a good starting point. We chose Sherwin Williams Sunbeam Yellow for the walls, in a flat sheen to help reduce the prominence of the imperfections in the old plaster. The trim received a bright white paint in gloss. The floors had been covered in pink shag carpet, and upon removal of the Pepto-Bismol colored rug, they were in terrific shape, only needing to be cleaned and waxed. A large 3 board crown molding was installed to add some drama. An antique chandelier with black metal shades with gold interiors was installed with a complimentary antique sconce on the wall near the stair. Before and after of entry hall. Notice the hideous wallpaper in the bathroom at the back. A large, very fine Federal looking glass was hung near the front door, with a Hepplewhite chair beneath it in gold silk. Opposite the mirror stands a working, large English Chippendale tall case clock with finely painted moon dial that keeps excellent time. The clock was restored professionally by the North Side Clock Shop in Hagerstown, MD. Antique wool runners lay on the floor, and an antique mahogany American Empire credenza dominates the large wall. A mid-century oil painting hangs above the credenza with art lighting for dramatic effect. We lovingly call the walls leading to the landing and second floor the portrait gallery. The oil paintings that line this section are all antique oil portraits of Maryland citizens of yesteryear, while the second floor holds 18th century European portraits. Architecturally the staircase is quite nice. It is a partial “floating” staircase, meaning that the steps and runners are built into the walls without vertical support. The newel post that dates to the 1830s is possibly a very early replacement of the original, which probably was simpler. The handrail is walnut. Beneath the staircase is a modern day powder room that occupies the space where the original back door was. This was installed in the 1950s. In the mid-1970s a renovation was done to make this an extremely tight full bath with brown fixtures, pink shag carpet, fringe border, and the piece de resistance, the brown on brown wallpaper depicting art nouveau styled naked women in perfume advertisements (can you imagine?). We had this completely removed, and a simple 2 piece powder room replaced it with classic black and white floor tiles, white fixtures and a gilt Empire mirror above the sink. Custom white plantation shutters finish the window. Something that has “bothered” us about the place since purchase is the road. While I wouldn’t consider it a super busy road, it does have its moments. The house sits on an infamous stretch called “Death Curve”. Cool Hollow sits directly on the creek, and just as you would imagine, in a hollow. The nature of the environment forced the road to take a series of dangerous curves around the steep hills, rocky outcroppings and of course avoiding the water. Several other run offs of Beaver Creek meet the Antietam at our property and therefore we have two 200 year old stone bridges at the property that are still in use. All of these elements create a dangerous stretch. Countless accidents and many deaths have occurred here over the centuries. A very early newspaper article from the 1820s tells of one man who had his head nearly decapitated when he fell beneath the wheel of his wagon. 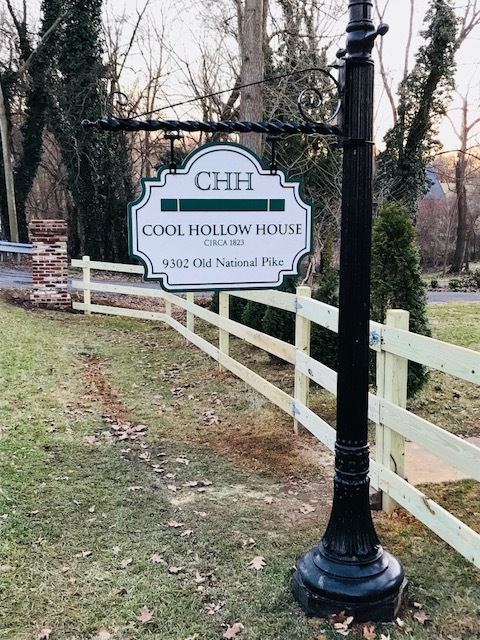 This story was to eventually lead to the legend of the headless man of Death Curve, even warranting its own chapter in a book about Haunted Houses of Harpers Ferry and surrounding areas. 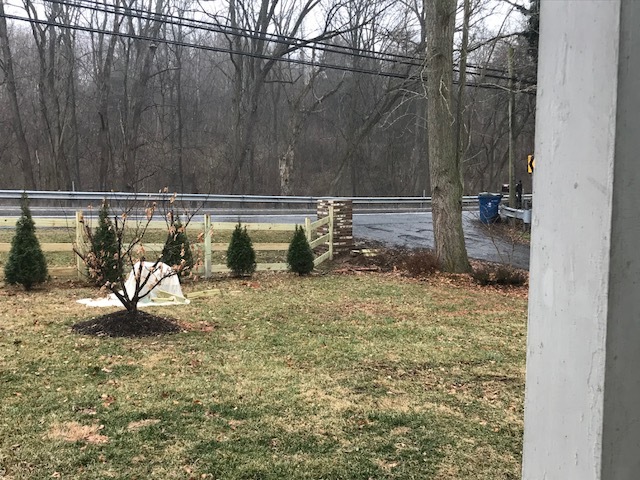 We decided this winter that it was time to build a fence to border the road at the front lawn. 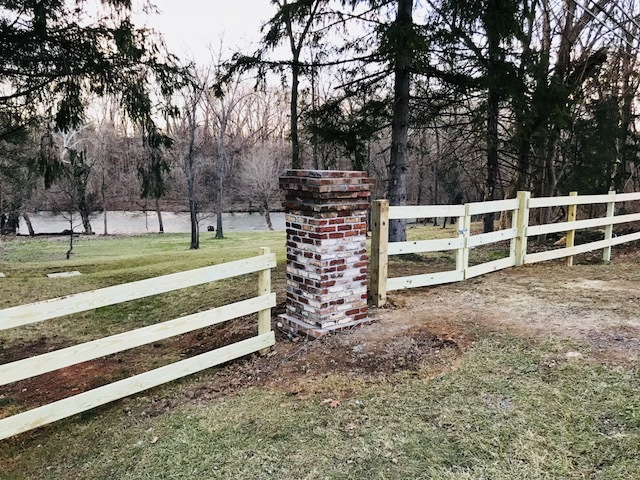 Naturally, not an ordinary fence would suit us or the property, so we started to think somewhat out of the box and poking around on Pinterest, looking in magazines, and taking ques from other historically significant homes. Images we used as starting inspiration, and the sketch I drew for the contractor to build from. 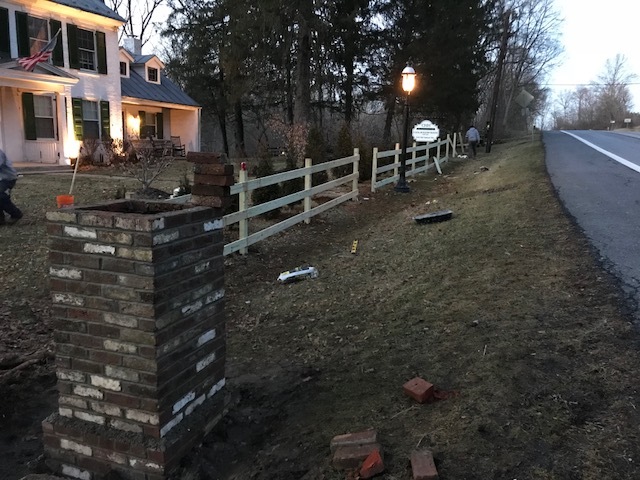 On a recent trip to Annapolis we studied the brick masonry of the Paca House, Brice House and other important homes and came up with the idea that we needed two brick pillars flanking the “formal lawn” with a board fence and a series of entry and service gates to run the span, painted black. We chose black as to not conflict with the white house, and therefore “busying” up the front. 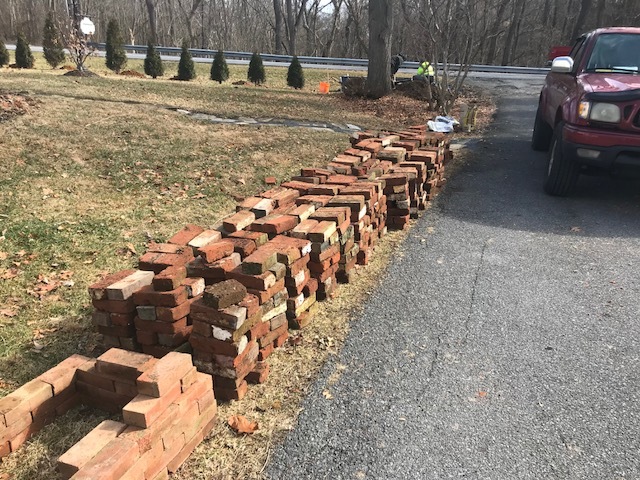 As the house is very old, we didnt want the brick to look brand new, so we began searching around on craigslist, and facebook marketplace and found an ad for over 1000 antique bricks for only $100. Over 3 loads in the back of the truck, hand picked and loaded, they were at our house ready to be used. Antique brick picked from an online ad. The fence was started last week, and is nearly complete. Older photographs show fences in this same location with large flowering bushes. We feel that this new fence enhances the front, helps retain privacy, and replaces earlier versions.